Hi all, I'm new to the forum but desperately need help, well my plant does! 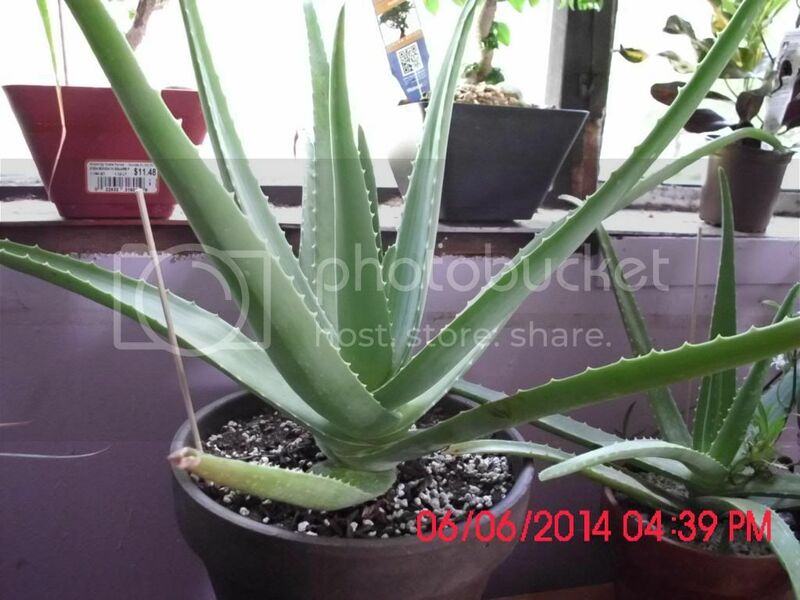 I have an Aloe Vera plant that's around 4 years + old (Can't remember when I got it) and is kept indoors. (I live in England where it rains most of the time!!!) It's near a South facing window. It has a long 'trunk' and is propped up. Although all the leaves are green and full of gel they keep thinning and bending at the trunk. My plant now has droopy sad looking leaves. Where did it all go wrong? Is there anything I can do? Can I cut the trunk and plant it? Will it grow roots if I do? Desperately want to save it. Re: Desperate lady with sad droppy leaved Aloe Vera. Scooby - welcome to the forum. Could you post a picture? That may help with problem identification. ElizabethB wrote: Scooby - welcome to the forum. I hope these photos come through. I can't remember the type of Aloe Vera, I did see the name on another website but forgot to note it down. Thank you baileysup. What special care do I need to take if I decide to chop the trunk? Scooby - Ok. Gently remove the plant from the pot. Remove the pups. Cut the woody stem 1/2 way up. Re-pot the roots with fresh soil. Pot the top in a new pot with fresh soil. The bent and broken leaves won't recover. Bent as in there is a crease in the leaf. You may need to put dowels around the top to support it while it develops new roots. Pot the pups individually. Let the bottom part dry out between watering. Make sure you have good drainage. Keep the soil in the pot that you plant the top in just barely moist until roots develop - a couple of months. Barely moist soil for the pups. Worst case scenario is that you will lose the top and base but still have the pups. Aloe really is tougher than you think. If the pups have no roots set them on a table outside - under cover - on newspaper. Mist them a couple of time a day. They will develop roots and can be potted. Plant shallow. Bury only the roots. If you bury the leaves you will end up with rot. Try adding 50% perlite to your mix, or a gritty mix only water when the medium is dry, stick your finger in about an inch if it's dry give it some water ..if its damp leave it be. When in doubt, DON'T . To increase drainage and air flow so your soil won't be so packed. Do aloe vera leaves form a rosette when older? Is this medicinal aloe or some other variety of aloe vera?